In the late 1930s, Duquesne University in Pittsburgh had one of the nation’s powerhouse college basketball programs. John “Brooms” Abramovic, a big. heft-handed kid from nearby Etna, Pennsylvania wanted to played for Duquesne, but head coach Chick Davies declined to offer him a scholarship. 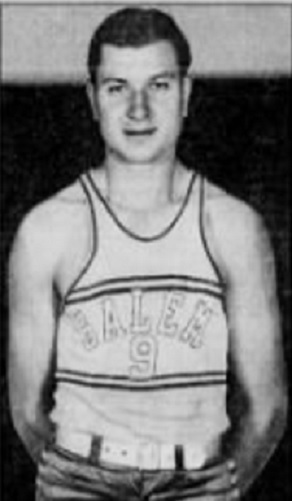 Instead, Abramovic entered Salem College, a small school in West Virginia where over three seasons (1940-43) he would rewrite college scoring records. As a junior and senior at Salem College, he led the entire nation in scoring, averaging nearly 30 points per game and was the first player in college history to score 2,000 points in a career (2,170). He also was chosen a First Team All-American in both 1942 and 1943. After spending three years in the Navy during World War II, Abramovic signed in 1946 to play professional basketball for Pittsburgh in the newly formed Basketball Association of America. Abramovic had a solid season averaging 11.2 points per game, but the team folded at the end of the season. After one more pro season, Abramovic retired and returned to Etna and joined the family Broom and Mop business. Abramovic officiated prep and college sport for over 25 years. Abramovic was elected to the NAIA Hall of Fame. John M. Abramovic Jr. Born: Feb 9, 1919 Died: Jun 9, 2000 Hometown: Etna, Pa.